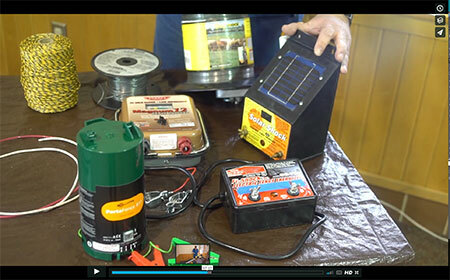 ADF&G has created three videos detailing the use of electric fences for homeowners (to protect chickens and livestock as well as smokehouses and property) and for campers and backpackers. The first video provides an overview of the materials needed, shown above. If you keep livestock in bear country, you need an electric fence to keep bears out. That’s really the simplest and best solution. Unfortunately, the idea of setting up an electric fence can seem daunting to some livestock owners. Kelly Fuller, manager of Alaska Mill, Feed & Garden Center, noticed that lack of confidence, even among her store employees who sell fence components. To help both her staff and the public, Fuller asked the Alaska Department of Fish and Game to come speak at the store on a recent Saturday about how to set up an electric fence. ADF&G wildlife biologist Tony Carnahan, who has spent a lot of time on farms and in Alaska field camps building electric fences, presented the hour-long workshop to an audience of about a dozen people. Carnahan covered how to build both temporary and permanent electric fences, along with construction tips and fence maintenance. Carnahan points out that even though we don’t think of Alaska as a big livestock state, a fair number of people do keep livestock. Raising backyard chickens has become very popular, even in urban areas like Anchorage. But livestock, and chickens, can be a significant bear attractant. Electric fencing terminology can be unfamiliar in the beginning, with terms like joules and amperage and discussions about whether to set up an all hot or alternating hot/dry fencing. Even so, most people can become fairly comfortable with the basics of setting up a fence in just an hour or two of study. 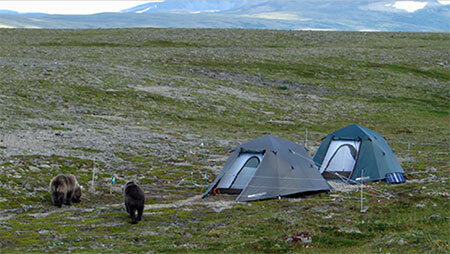 Portable electric fences can be effective for hunters and campers in bear country. The wires in an electric fence carry a high voltage, low amperage charge, delivered in short pulses. When a bear touches an electric fence, it will shock the bear and create pain and fear, but it will not harm the bear. The same thing happens to humans who inadvertently touch an electric fence. As Carnahan puts it, it’s an unpleasant mistake that won’t harm you, but you probably won’t do it twice. Attending a workshop is one way to learn about electric fences, but if you don’t have access to an in-person class, ADF&G has a host of online resources to help. Last year the Department, with filming and editing help from volunteer Wayne Hall, produced three short videos that demonstrate all the parts to an electric fence, and how to set one up. To learn more and view the videos, visit the "Living with Wildlife" webpage, specifically the “Electric Fences as Bear Deterrents.” There you will find three short videos – one that provides an introduction and an overview of the various parts you will need, a second that will teach you how to set up a relatively lightweight and temporary fence for backcountry purposes and a third for more permanent installations, suitable for livestock, beehives, smokehouses or other bear attractants. 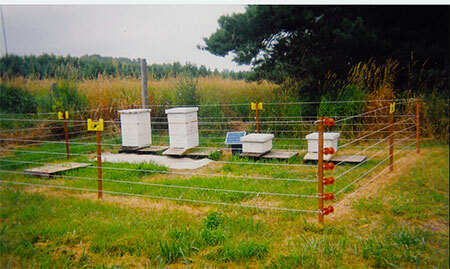 Bees and hives attract bears, and bears will eat the bees and larvae as well as the honey. The page also provides detailed information about the kind of charger you will need, what wire and fence posts to buy, how to build a gate and how to maintain your fence. Electric fences really do work to deter bears and other wildlife. As Carnahan points out, people use them for all kinds of purposes, including to protect airplanes, animal feed, beehives, hunting camps, fish camps, landfills, lodges and cabins and domestic animals. How you build your fence depends on what you need to protect, and your site conditions, Carnahan said. The main thing is to not be intimidated. Visit our web page, and if you need help, don’t be afraid to ask questions. Fence suppliers can help, and often, local ADF&G personnel may be able to offer advice too. If you learn best by reading manuals, another helpful resource is “Deterring Bears with Electrified Fencing: A beginner’s guide.” part of the Montana Fish, Wildlife and Parks website - see “Important Bear-Aware Tools” to find this detailed guide.